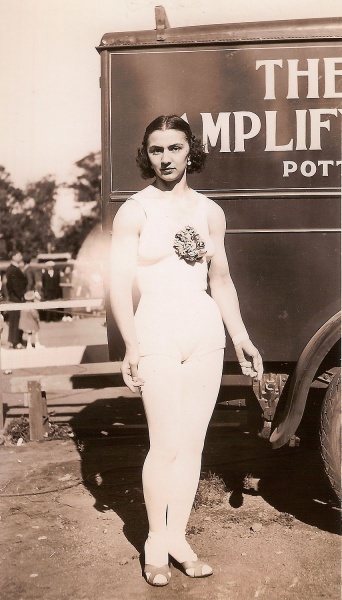 The circus artist and powerwoman Luisita Leers was born into a circus family - her mother was Gertrude Reichenbach who appeared with acrobatic act. Luisita Leers conquered the circus world with her acrobatic performing arts in the 20s and she impressed with a muscular physique which was only seldom existing for women at that time. 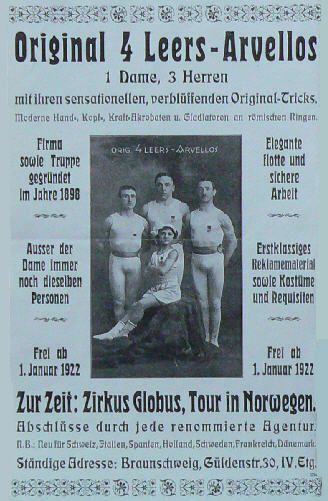 Her real father left the family already in 1911 and her mother got married with Guido Krökel, who worked as a concortionist and also appeared together with the Leers-Arvello troup whose speciality was the acrobat men pyramid and their skill at the men's ring. Her stepfather introduced her into the hard world of circus artists and at the age of eleven she already appeared together with the Leers-Arvellos. Luisita Leers extended her artistic abilities day-to-day and she soon was able to exercise the one-armed plange, this means to rotate at the Roman rings in vertical position like an airscrew and the "Iron Cross", which was only performed by men at that time. Her enormous power at a still young age allowed her hold her stepfather with only one arm during an artistic number. But Luisita Leers had greater ambitions than only to be a member of a troup and she began to elaborate a solo program along the way. 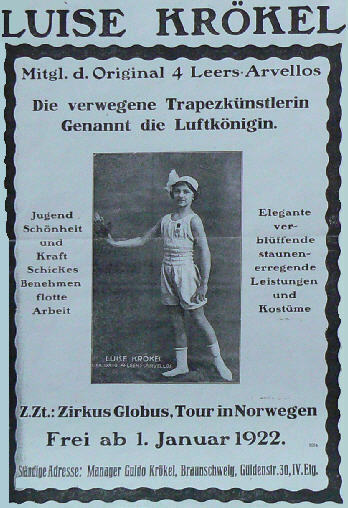 Her first single appearance in the circus arena was with a number at the trapeze in 1926 and the astonished audience soon called her the "Wundermädchen". Because of the enormous success she soon got engagements from the most famous circuses around the world, among them the Wintergarten and the Scala in Berlin and the Roxy in New York as well as by the legendary Ringling Bros and Barnum & Bailey where she appeared between 1928 and 1933. To her most impressive excersises belong the rotation which she partially showed more than 100 times backwards in a row and of course the neck-hang where she only fixed her body with her neck on the trapeze and at the same time showed a vertical split holding one leg up. 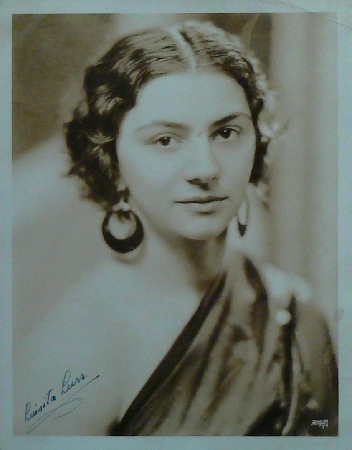 After her return to Europ she was engaged by the circus Medrano in Paris where she again attracted the audience and critics with her daring feat in dizzy height without a net. After other engagements she returned to Germany where she was able to continue her career. But with the outbreak of World War II she was no longer able to carry out her work, moreover she also left her house with all her costumes and equipments after a bombing by the allies. After the war she could not replicate her former success. In 1952 she got married with Gerhard Klages and called herself Luise Klages. She worked as a translator and finally she founded her own translation agency. She was well-known in Hannover as a vehement antagonist of animal experiments. When her husband died a mental "decline", retired from the translation business and attended to supernatural power. By the way she remained artistically busy as a sculptor. A special thanks goes to Mr. Markschiess van Trix for additional information.